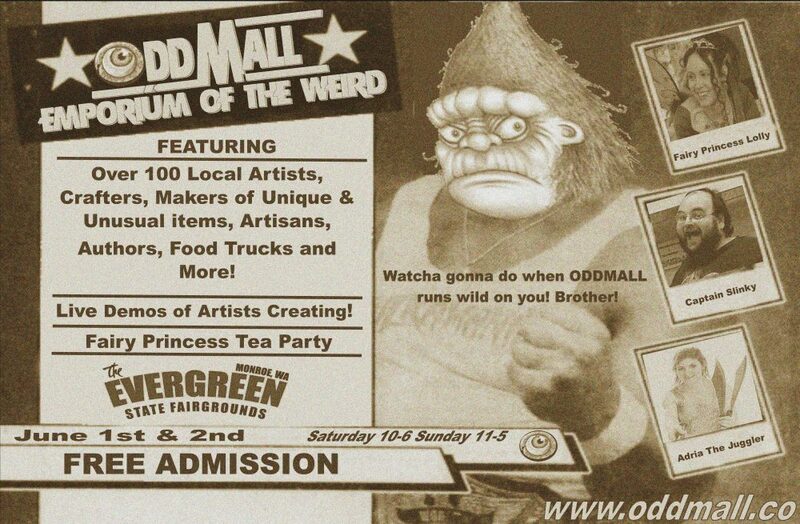 ODDMALL: Emporium of the Weird returns to Everett! We are a little under 2 months away from our next big show taking place June 4 & 5, 2016 at the Holiday Inn, Downtown Everett,Wa. Conveniently located off I-5. Oddmall features over 130 of the Pacific Northwest most unusual, most talented, most bizarre Artists, Crafters, Authors, Entertainers and more! Oddmall is a cosplay friendly event! We encourage uniqueness with out visitors and vendors. Come spend the day with us in the Emporium of the Weird! Always free admission and plenty of free parking. In addition to over 130 vendors, Oddmall features a stage with live entertainment all day long. A very special area called Fairy Hollow featuring Fairy Princess Lolly, a Fashion Show presented by Dames for Dreams and more!